Buy One AIR Loudspeaker and Get the Second for Half Price! 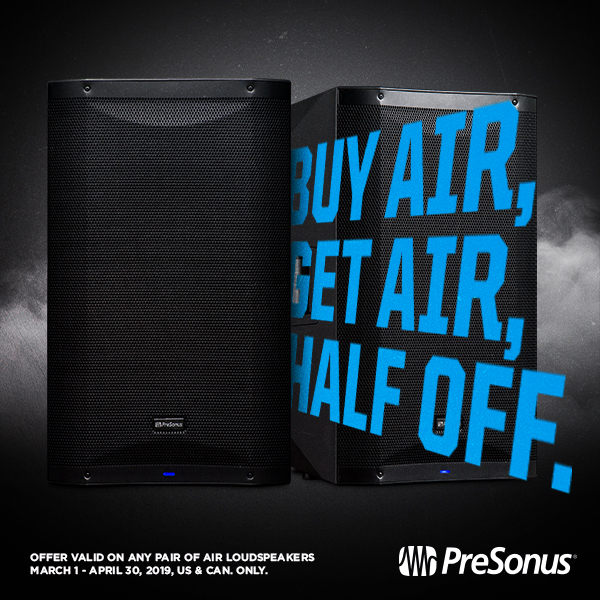 Starting today and ending April 30, 2019 buy one AIR Loudspeaker and get the other for half off! This offer begins today and ends April 30 and is available in US and Canada ONLY! Of course we’ll always go with PreSonus. But you don’t have to take our word for it. Watch John Tendy explain why the AIR 10s are perfect for him. Click here to learn more about the AIR Loudspeaker family! Click here to find a dealer outside to the US. Comments Off on Buy One AIR Loudspeaker and Get the Second for Half Price!